I walk. A lot. Outside of towns, along country paths, over meadows, trailing through woods. Miles away from the nearest convenience. This entry was posted in Photos and tagged #2019picoftheweek, Photos. Bookmark the permalink. 20 Responses to Which Way? What a waste (of signs)! Actually, what you can see is the No Entry is the entrance, and it gives on to the Market Place, where I popped into a pub before catching the bus home. Pedestrian thoroughfare or mall, then. Got it. Thoroughfare. I shall be posting my photo of that at a later date. It has quite a picturesque Market … er … um … place where they used to take the taxes on products sold at the market. But unlike at Norwich, it’s not a guildhall. Though I can imagine it once served as that. And probably were exceedingly cramped. So were you rambling when you arrived there, or now that’s you’re talking about it? Thought you’d pick up on that. Both. I went for a ramble around town, particularly the abbey which is now only a parish church, and a couple or three miles alongside a small river etc. A pleasant day. Temperature hit 16 degrees C. It thereafter fell. I’m hoping to get out on Thursday. Tyrells Wood, I love that name. 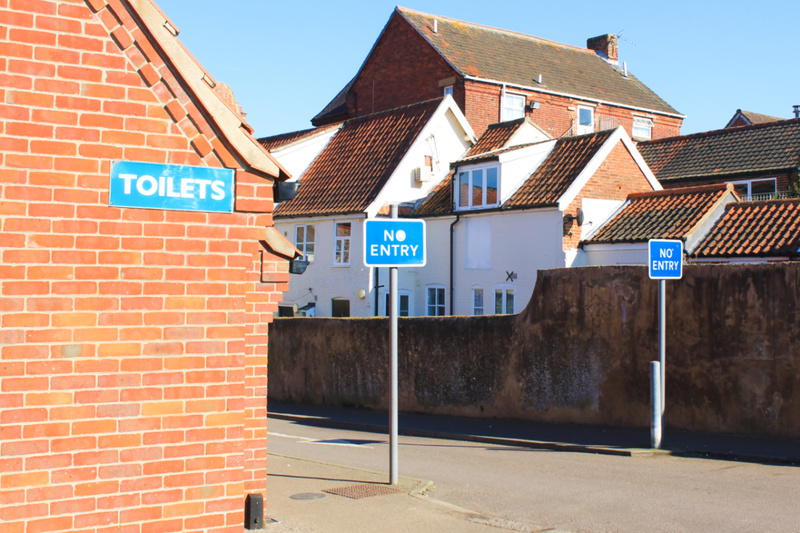 Why do they have signs saying you cannot enter the toilets? I’ll tell you I would pass them right by and use them anyway if I had to…….